Paul Carey (1904-2001) was an exhibiting artist who spent his life in the San Francisco Bay Area. He left an archive of at least 1,000 paintings, watercolors and drawings, the majority of them landscapes made around the Bay and the San Mateo and Mendocino shoreline. Sometimes described as a Modernist, he was an important member of the group of plein air artists that has defined Bay Area landscape painting from the 1930s on. In his early years, Carey occasionally painted with a group of Modernist painters known as the "Society of Six,'' later partnering in a San Francisco graphics design studio with with one member of the group, watercolorist Maurice Logan. Carey was one of the Thirteen Watercolorists, a regional group of artists that included Logan and others. Some of his paintings are also exhibited in the Bohemian Club, of which he was a member for many decades. 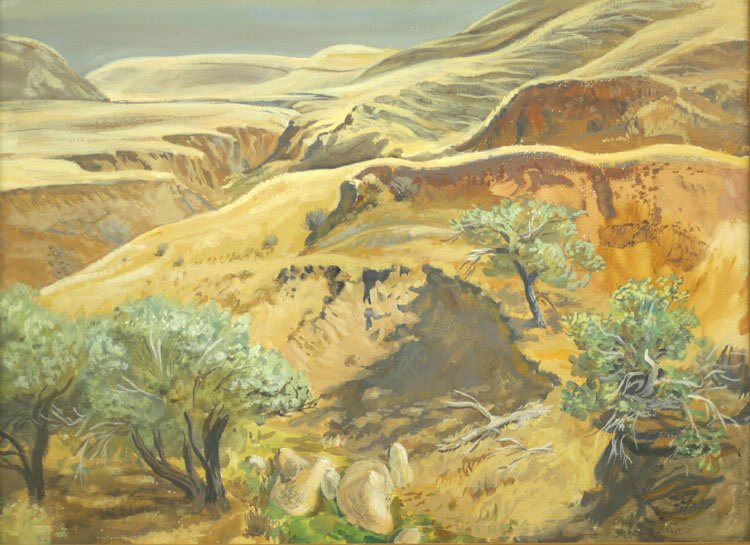 Carey painted and sketched throughout California (the Gold Rush country, the Sierra Mountains, the Mendocino coast and for years, the area around Pescadero on the San Mateo County coast) as well as the Southwestern U.S., Utah, Hawaii, Canada, England, France, Italy, Spain and Portugal, Morocco. He taught at the California School of Arts and Crafts, University of California at Berkeley Extension and the San Francisco Art Institute.